A great meal last night in Buffalo before my early flight-- Mom made up her barbecue sauce (ketchup, pineapple juice, brown sugar... what else?) for the chicken and Dad grilled it perfectly. 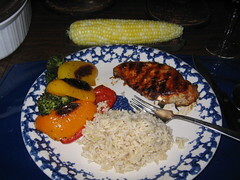 The corn was picked this morning and tasted fresh and sweet-- I had two ears with a little butter, salt, and pepper. The oven roasted vegetables-- peppers, broccoli-- were browned, seasoned with a little olive oil and herbs. Mom even made me a chicken sandwich for a late snack on the plane-- I didn't get into SF until about midnight.